(Nanowerk News) NC State University, Duke University and UNC-Chapel Hill are launching a partnership to give businesses and educators access to expertise and facilities that will speed the development of new nanotechnology-based products and educational opportunities. The partnership, called the Research Triangle Nanotechnology Network (RTNN), is led by NC State and is supported by a five-year, $5.5 million grant from the National Science Foundation. 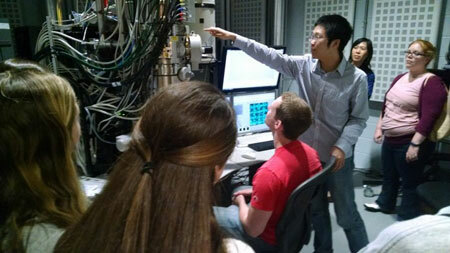 Students and researchers in NC State's Analytical Instrumentation Facility. The bulk of the funding will be used to hire staff who will be dedicated to reaching out to potential industry and educational partners to identify ways that RTNN can address their specific needs. And RTNN has a variety of resources that they’ll be using to help achieve those goals. In addition to providing expertise, it will also give the public access to a wide array of powerful tools to help them advance their innovations from concept to prototype and, ultimately, through manufacturing for the marketplace. For example, NC State’s Analytical Instrumentation Facility has the ability to look at the structure of nanoparticles in three dimensions and the individual positions of atoms in a nano-device. The latter is done using a technique pioneered at NC State called “revolving STEM” and a state-of-the-art aberration-corrected scanning transmission electron microscope. “This will be used to help develop and fine-tune technologies in fields from drug delivery to water purification to nanoelectronic devices,” Jones says. Between NC State, Duke and UNC-Chapel Hill, RTNN has a suite of other facilities that will also be valuable to outside groups. These facilities have capacities including nanofabrication of electronics, textiles fabrication and characterization, sophisticated materials characterization, and labs that evaluate interactions between nanotechnologies and the environment.